Below is our full range of key rings, tags, lanyards, card & ID holders that can be printed for great branding, advertising and marketing. 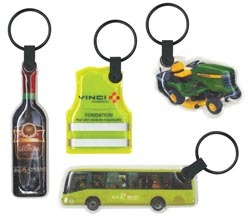 Below is our range of key tags, rings, floats and lanyards. W 30mm x L 73mm (Dia 25mm Ring). Dia 40mm (Dia 25mm Ring). Resin Coated Finish: Please ask for a printing template. 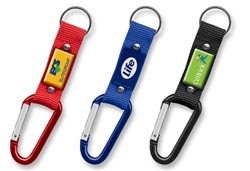 Flexible key ring with a durable resin coated finish. Printed in full colour on both sides at no extra cost. Standard colours available out of stock: white, yellow, red, green and blue. Other colours available, please ask. Low cost hard plastic key ring. Please note we can also manufacture most colours for you however, for this service there is a minimum order of 2500 (or $200 special moulding machine setup), there can be a 10 working day wait for special colours. Note the prices above exclude GST except for the sale of 1unit which is retail and includes GST. Printing setup $66.50 per colour and/or position for pad printing. Includes first half hour of artwork. Subsequent extra artwork $75.60 per hour (both excl GST). Repeat prints in the future with no changes are $47.50 per colour/position. W 40mm x L 40mm (Dia 25mm Ring). Key Ring Colour - clear. Digitally printed allows unlimited colours on both sides. Supplied in a poly bag. Fully functional good quality finger nail clippers with an attached key ring. Wrap print - 60mm wide x 35 mm high. Buoy shaped keyring floats with a full set of keys, ideal for boats. Key ring with a quality compass inserted. Branded with a full colour resin coated finish. Packaged in a gift box. Note the prices above exclude GST. Printing setup $95.00 full colour. Includes first half hour of artwork. Subsequent extra artwork $75.60 per hour (both excl GST). Repeat prints in the future with no changes are $47.50 full colour. Dimensions: Body 47mm x 37mm x 10mm excludes chain. Ring – 30mm. colour resin coated finish on both sides. Laser Engraving – 25mm x 16mm. Resin – 31.8mm x 20.7mm. Can be branded on one side with laser engraving or in full colour with a resin coated finish. Dimensions:Body – 58mm x 31mm x 4mm. Inner oval part spins and has provision for a logo on both sides with a full colour resin coated finish or laser engraving. Only one setup charge is required for engraving on both sides even if the copy is different. Colours: Anodised Silver, Anodised Blue, Anodised Black. Dimensions: W 25mm x L 45mm x 2mm (Dia 25mm ring). Branding Options: Resin Coated Finish: 36mm x 21mm (oval). 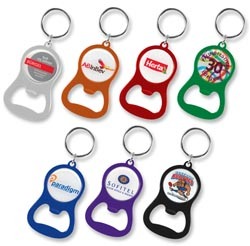 Light weight metal key ring branded on one side with a resin coated dome. Dimensions: W 28mm x L 55mm x 7mm (Dia 35mm Ring). Branding Options: Resin Coated Finish: 34.5mm x 19.6mm. 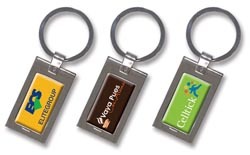 Metal Key ring branded on one side with a resin coted domed print or laser engraving. Print Area: Laser Engraving – 23mm x 17mm oval. Branded on one side with a full colour resin coated finish or laser engraving. Colour: Shiny Chrome. Dimensions; W 35mm x L 40mm x 5mm (Dia 35mm Ring). Metal key ring with a rotating house shaped inner part that can be branded on both sides. W 29mm x L 53mm (chain 700mm approx). An innovative product which has a variety of uses. Put a QR code on it that links to a website that has special offers which can be updated regularly. Also useful as a membership pass or with a bar code that gives a special discount offer. The applications are only limited by your imagination. Dimensions: Body – 55mm x 34mm. Print Area: 32mm x 23mm. 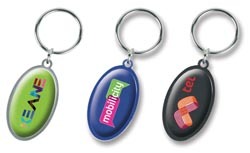 Metal key ring branded on both sides with resin coated domed finish print. Robust metal bottle opener with a key ring. Ideal for laser engraving. W 15mm x L 80mm x 15mm (Dia 25mm ring). W 22mm x L 65mm x 12mm (Dia 25mm Ring). Dimensions: Dia 16mm x L 70mm (Dia 25mm ring). W 24mm x L 60mm x 10mm (Dia 25mm Ring). Has two powerful LEDs. Uses button cell batteries that can be replaced. Handy little cutter with safe locking mechanism for blade. Supplied in poly bag. 2 metre metal tape with metric and imperial graduations. Supplied in poly bag. 1 metre metal tape measure with metric and imperial graduations. Supplied in poly bag. Colours: Black with Beige trim. W 110mm x H 70mm x 13mm (Dia 30mm Ring). High quality plastic short rectangular, oval, long rectangular key ring branded with a stunning full colour resin coated finish. Can also be printed on the reverse in spot colour. 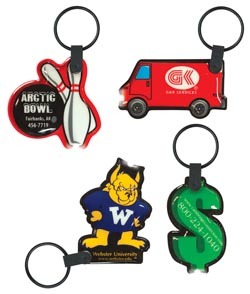 Ideal for promoting your logo with resin coated finish and using the back of the key ring to promote the different company offices or sales people. W 31mm x L 55mm x 7mm (Dia 32mm Ring). W 27mm x L 65mm x 7mm (Dia 32mm Ring). W 36mm x L 55mm x 7mm (Dia 32mm Ring). W 32 mm x L 130 mm x 8 mm (includes ring) (Dia 25 mm ring). Quality Key ring with a secure carabineer clip with the option of resin dome or engraving. Note. This is an indented product and 25 working days from sign off of proof is required for production. Dimensions: As per the size and shape requested. Branding Options: Full Colour Print: To fit the size and shape requested. Soft foam filled key ring with a powerful light that can be made in any shape and printed in spot colour or full colour on both sides. A lead time of 25 working days applies to this product. 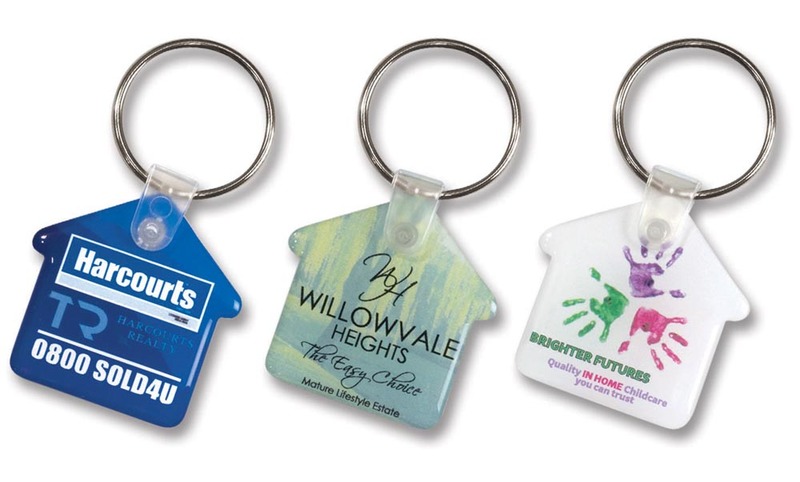 Soft foam filled key ring that can be made in any shape and printed in spot colour or full colour on both sides. A lead time of 25 working days applies to this product. Standard Sizes: 40 mm x 20 mm, 50 mm x 30 mm, 60 mm x 40 mm, 70 mm x 50 mm, 80 mm x 60 mm, 90 mm x 70 mm. Rubber Injection: Available on both sides. Screen Print: Available when only one side is injected. 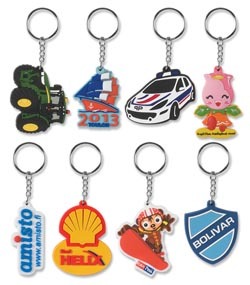 Flexible PVC rubber injected key rings manufactured in custom shapes. Can be injected in a two or three dimensional image on one or both sides in up to 4 colours but more colours are available for an additional charge. When the key ring is injected on one side the reverse can be overprinted. Choose the size you want from the standard sizes available and send us your idea and artwork we will create the design. L 55 mm x W 32 mm x 9 mm (Dia 25 mm ring). W 29mm x L 53mm x 2mm (Dia 25mm ring). Frosted Black with Silver trim. W 29mm x L 50mm x 13mm (Dia 33mm ring). Laser Engraving: 35mm x 15mm. Due to the volatility of USB pricing, exchange rates and the like please inquire for our latest pricing. L 93 mm x W 71 mm x 6mm (Dia 25 mm key ring). Will hold 2 plastic cards and is supplied complete with a key ring. Has thumb slots on the front and back so both cards are easily removed. Ideal for credit cards, ID cards, fuel cards, membership cards etc. Can be fitted to a lanyard. L 89 mm x W 64 mm x 4 mm. (Dia 25 mm key ring). Will hold one plastic card and is supplied complete with a key ring. Has a thumb slot on the back so the card can be easily removed. Ideal for credit cards, ID cards, fuel cards, membership cards etc. Can be fitted on a lanyard. Freight Free to main centres in conjunction with orders over $300. Lots of different colours. Special colours can be manufactured. Ask for quote. Available in white only. Special colours can be manufactured. Ask for quote. Colours: Silver, White, Yellow, Orange, Pink, Red, Bright Green, Green, Light Blue, Dark Blue, Purple, Black. Dimensions: W 7 mm x L 450 mm. Branding Options: Branding is not available. Multi Purpose Lanyard available ex stock in New Zealand. EPI Code 106869. Ultra low cost lanyard with a detachable loop that allows many items to be attached to it. Printing is not available on our Multi Purpose Lanyard, ex stock from NZ. Please see the indent options. Twister Lanyard. EPI Code 107071. Unique lanyard that has a 2 colour twist running through the cord. Comes complete with a safety clip and a slider that can be branded in full colour with a resin coated finish. Each of the colour twists can be matched to different PMS colours for a minimum of 1000pcs. A lead time of 15 working days applies to the lanyards in PMS matched colours. Quantity Lanyard including Full Colour Resin Dome Circle. Colours: White/Red, White/Blue, White/Black, or matched to PMS min 1000+. Note PMS matching is only done on indent, 15 working days after sign off of proof applies. Dimensions: Dia 5 mm x L 450 mm. Branding Options: Resin Coated Finish: 26.4mm circle plus bleed if required. Complete with safety clip. Supplied in poly bag. Available in white, yellow, red, green, blue, black, orange. 12mm width x 490mm in length. Standard Unprinted Lanyard available ex stock in New Zealand. EPI Code 100225. Printing is not available on our Standard Lanyard, ex stock from NZ. Fits onto any lanyard and holds a 102 mm x 72 mm insert card. The optional insert card is available on request and can be printed on both sides. This is for the plastic card holder and/or card only. Can be purchased with the lanyard left. Printing setup $66.50 full colour. Includes first half hour of artwork. Subsequent extra artwork $75.60 per hour (both excl GST). Repeat prints in the future with no changes are $47.50 per colour/position. Note there is no setup charge if the holders are being supplied without the insert card. Dimensions: W 20mm x L 510mm. Branding Options: Full colour sublimation print, please ask for template. Lanyard that includes full colour printing on both sides at no extra cost. Available on indent with a very short lead time. An optional safety clip is available on request. on the bottom line, Safety Clip; Loop Attachment; Snap Lock Joiner. Complete with safety clip. Supplied in poly bag. Standard Colours: Silver, White, Yellow, Orange, Pink, Red, Bright Green, Green, Light Blue, Dark Blue, Purple, Black. Special PMS colours are available for a minimum of 1000pcs. Important: This item is indented and delivery takes approx 15 working days from proof sheet being signed. Orders cannot be cancelled from this point and we can take no responsibility for late delivery. 12mm 103799, 16mm 103800, 20mm 103801, 24mm 103802.
design your own lanyard from 12 standard colours and 7 standard attachments. The fabric is woven polyester. Simply choose the attachments required. 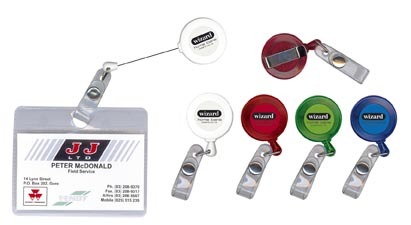 Lanyards can also be supplied with our plastic card holder already attached to save assembly time. Other attachments are available on request. A lead time of 15 working days applies to this product. PMS matched colour printing 10c per colour, minimum 1000 units. Note the prices above exclude GST. Printing setup $66.50 full colour. Includes first half hour of artwork. Subsequent extra artwork $75.60 per hour (both excl GST). Repeat prints in the future with no changes are $47.50 per colour/position. Print area 18mm circle (printed or full colour resin dome). Note - Doesn't include the card insert, see 5132 above . Colours: White, Frosted Yellow, Frosted Red, Frosted Green, Frosted Blue, Black. Dimensions: Dia 19mm x 78mm (lanyard 860mm approx). Full Colour Print: 40mm x 10mm. Lip balm with a convenient lanyard attached. The lip balm has an SPF20 sunscreen included.